Made with milk or dark chocolate and colored cocoa butter, these ladies high heeled shoes are completely edible. Each one is crafted individually and no two are alike. They are paired with a small paper purse containing bittersweet chocolate coins and a caramel milk chocolate flower. Please allow 2 weeks for a custom shoe. A gift of beautiful chocolates is a unique addition to any special occasion. 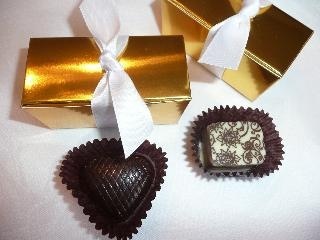 For celebrations and holidays, I am happy to work with you in customizing chocolates to fit with your event. From orders for small celebrations to large wedding receptions or special events, I can create chocolates that will be long remembered (and that can include a personal note from you). 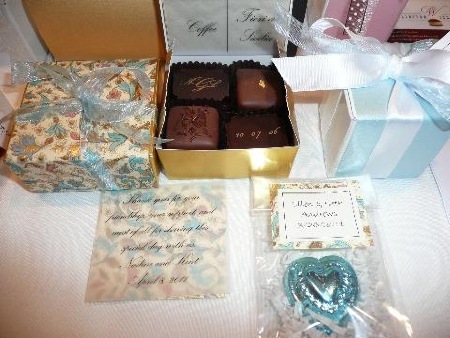 For a wedding, present your guests a lovely 2-piece or 4-piece box of chocolates with your names or initials and perhaps the date of marriage imprinted on the chocolates (see CUSTOM LOGOS). I will provide your preferred flavor of chocolates, along with the colored box and ribbon of your choice. 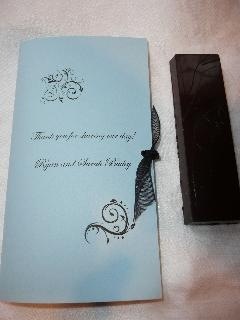 I can also include a short note from you in the box that will let your guests know how much their presence means to you. Tuck in a heart shaped truffle or two and your guests will open a box of chocolates that they won’t forget. This one-ounce bar is sealed in cellophane, then attached to your personalized wrapper and tied with a ribbon. Available in three flavors: caramel milk chocolate, dark-milk chocolate with toffee and sea salt or dark chocolate with nuts. $3.00 each / minimum of 20. When you order in bulk, the price goes down per box. Contact Julie at 425.486.2270 or email info@wellingtonchocolates.com for more information and prices. If you choose to have a monogram, date, or name printed on your chocolate, please note there are extra costs for CUSTOM LOGOS, starting at $100. I would be delighted to work with you on your special order. Please call Wellington Chocolates at 425.486.2270 or email orders@wellingtonchocolates.com to ask any questions or discuss details. Appointments can be made to view chocolate, box and ribbon options.